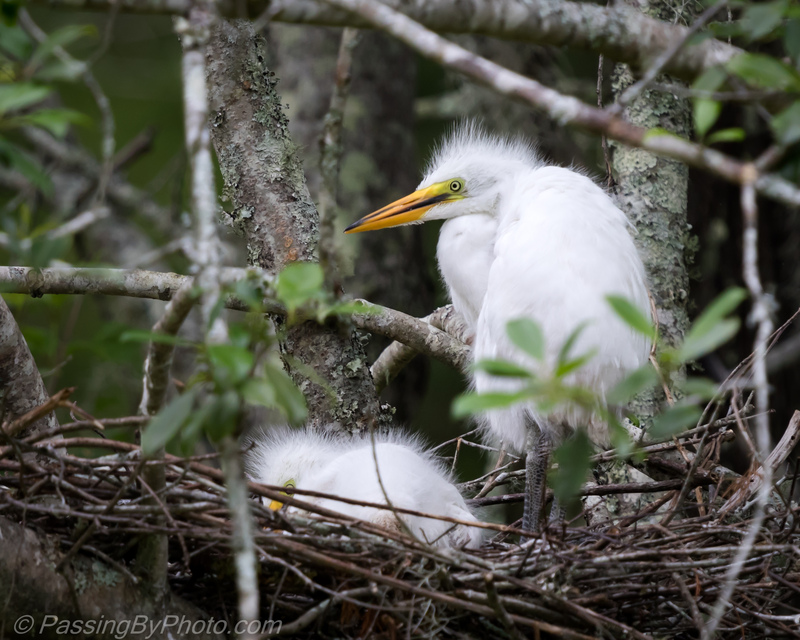 Great Egret chicks number two was resting comfortably on his pile of sticks. If you look closely you can see his eye is open, but he wasn’t moving. Number one is up and wants the world to know. 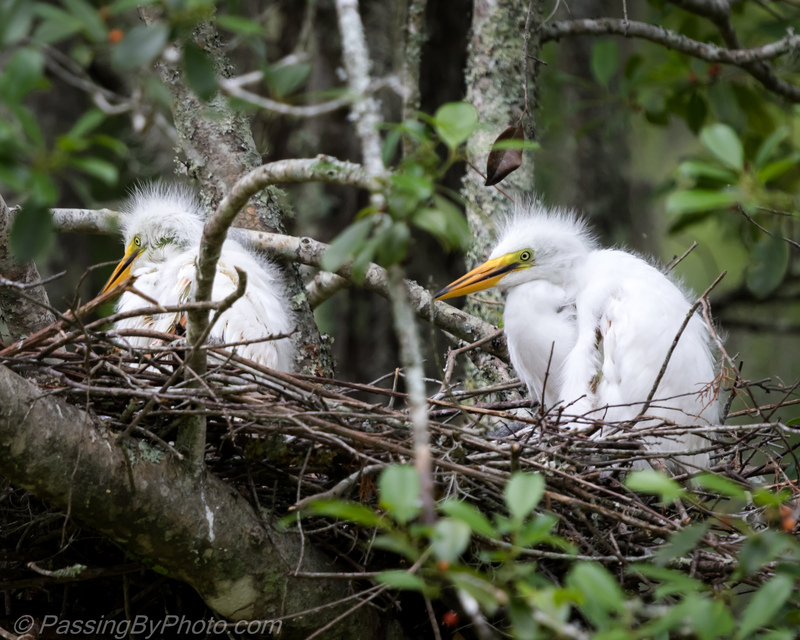 The egret and heron chicks spend weeks in the nest with no where to go and not much to do. When they get older I’ve seen them spar with each other once in awhile. Otherwise, getting fed and growing is their main order of business. Oh, and sleeping. 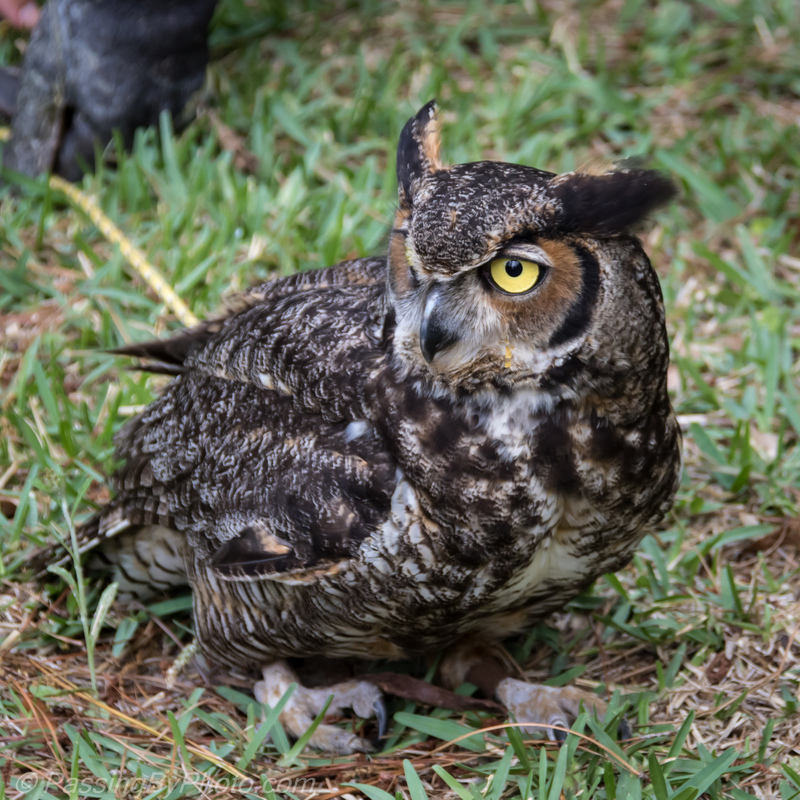 It’s easy to see why Owls are one of the biggest attractions at the Center for Birds of Prey. Trained to participate in the Center’s Environmental Education programs, they tend to sit calmly on a perch giving a wonderful opportunity to see them up close. 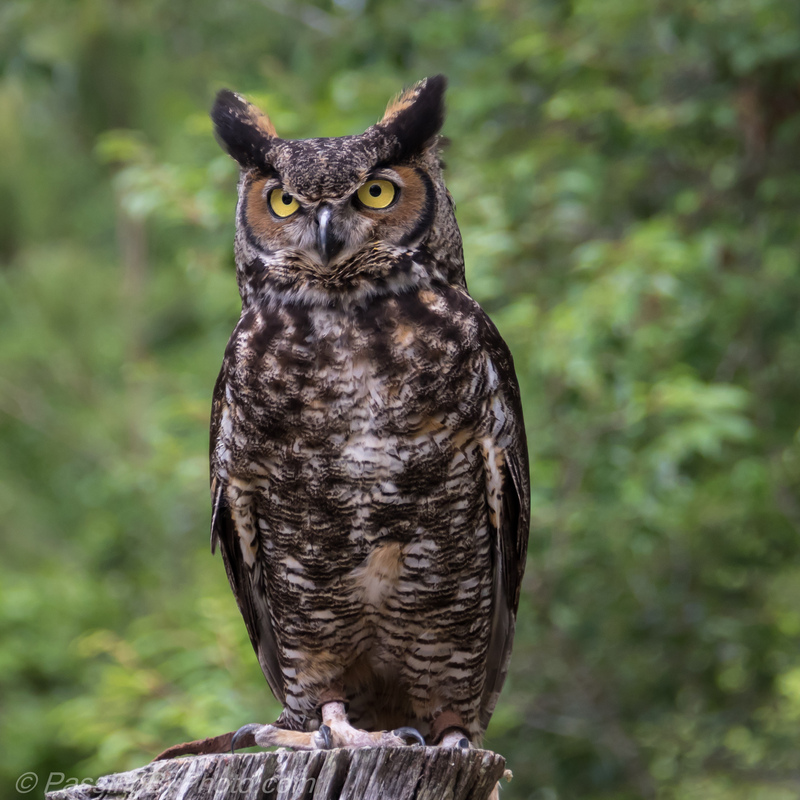 This Great Horned Owl, however, was intent on getting on the ground for a few minutes. His handler waited for him to look around and settle. After a bit he went back to the perch and showed off with a lovely pose. 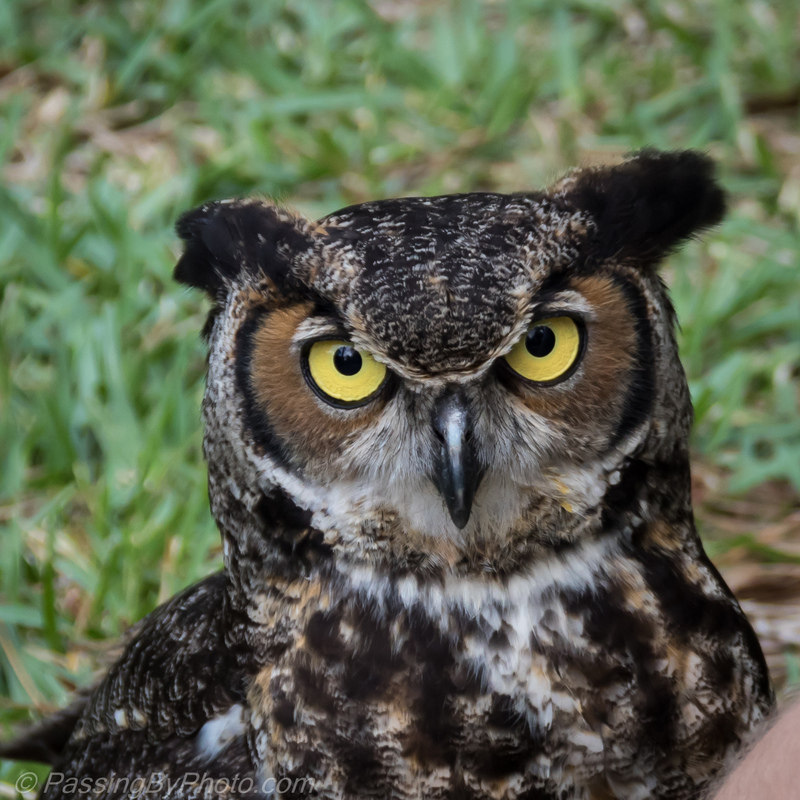 The Center for Birds of Prey, Photography Day, April 2017, Awanda, SC. 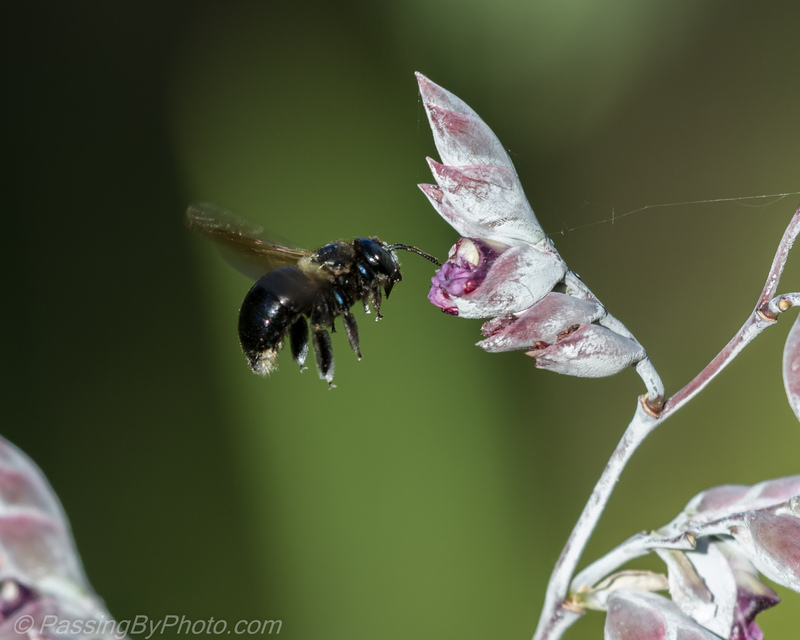 I don’t know the plant or the insect. 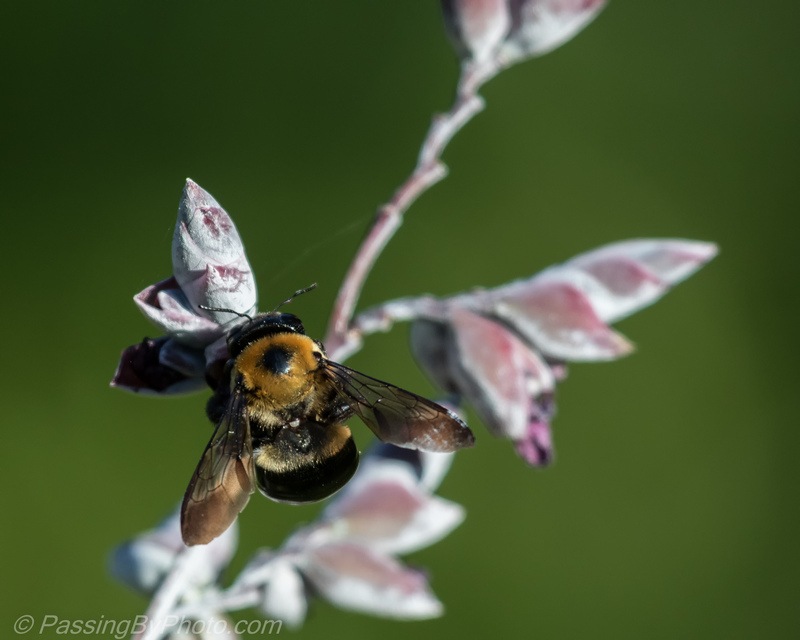 Rather pretty up close, the insect has a furry looking yellow jacket, but is not what I think of as a “Yellow Jacket.” The small flowers are on tall stalks growing in standing water at the edge of a swampy area. 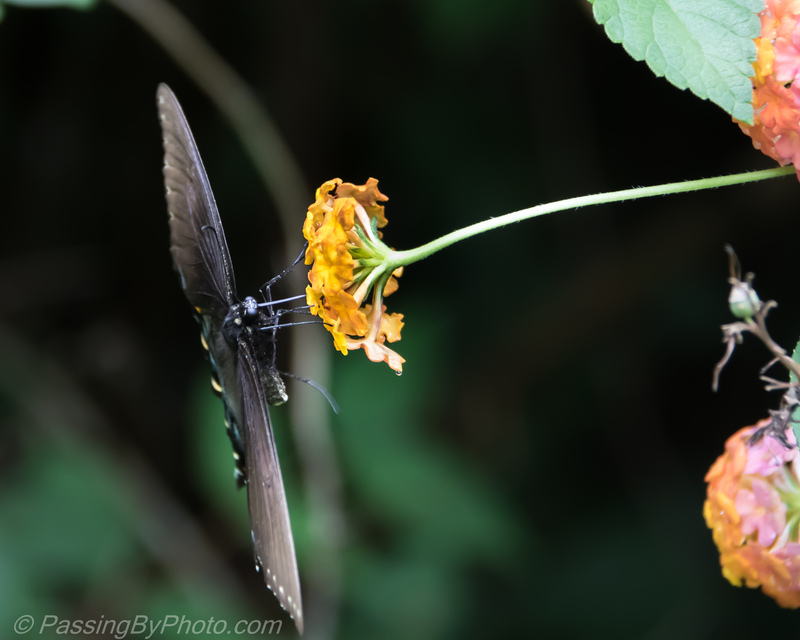 The insect must have been getting some nourishment satisfaction or good taste because he kept at it, going round and round the plant. Except for the purple highlights on the leaves, the plant is not particularly attractive to look at. I should go back in a week or so and see what it might have transformed into. All together now, everybody look to your right. Now split, and hold that position. Now everybody look to your left. 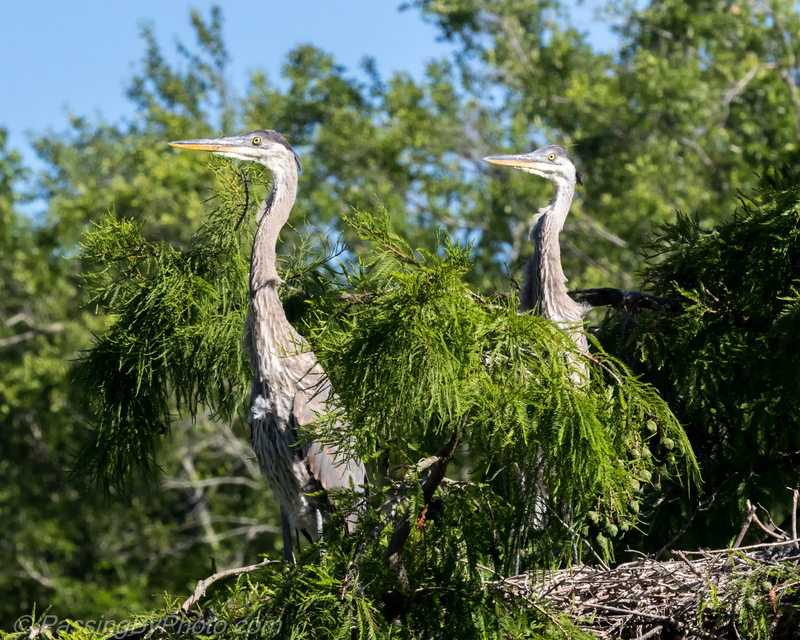 The juvenile Great Blue Herons learn the “stare and pose” routine early on. These two occasionally are like synchronized swimmers as they scan the perimeter. “Everyone has to eat.” Lots of folks I meet at the swamp say this as we watch nature’s stories unfold, but they don’t want to see the birds be lunch. 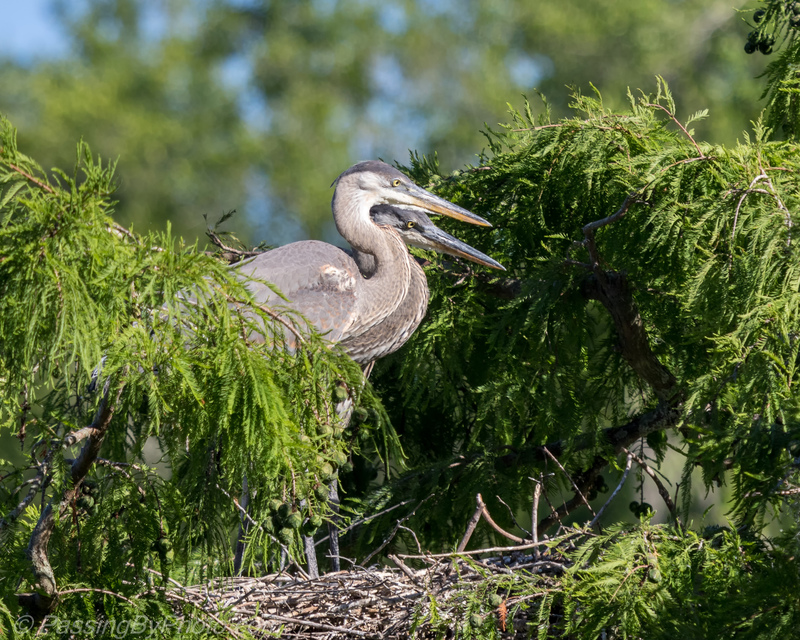 Birds that fly low over the Alligators may get snatched, chicks sometimes fall out of the nest or get pushed out by a more aggressive bird, and then there are those that are in the water on purpose, including Ducks and Anhinga. 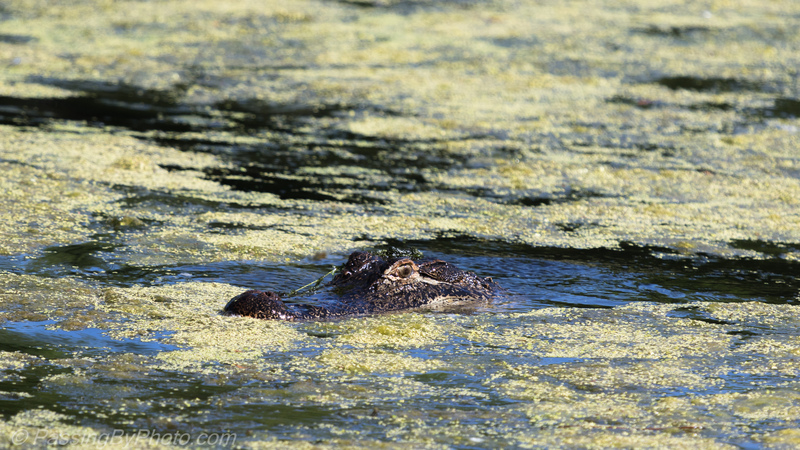 This Alligator had his sights on an Anhinga that was swimming looking for his own lunch. 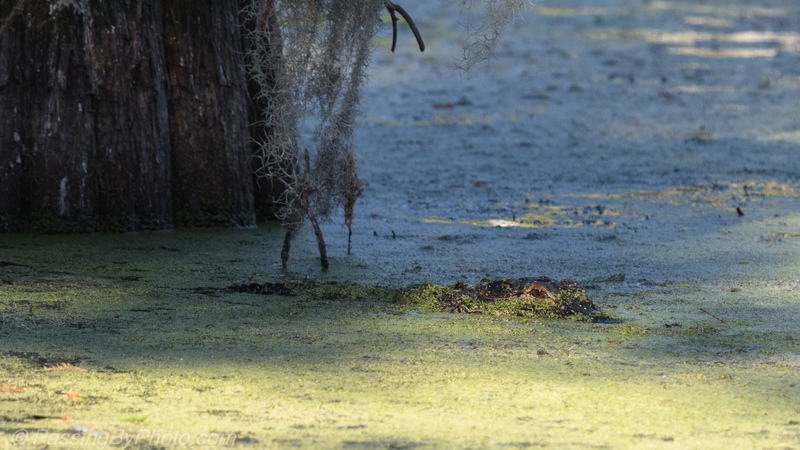 With the duckweed cover over the water they must search based on their prey’s movement –there can’t be much light getting through. He started out with a dash, legs churning the water. 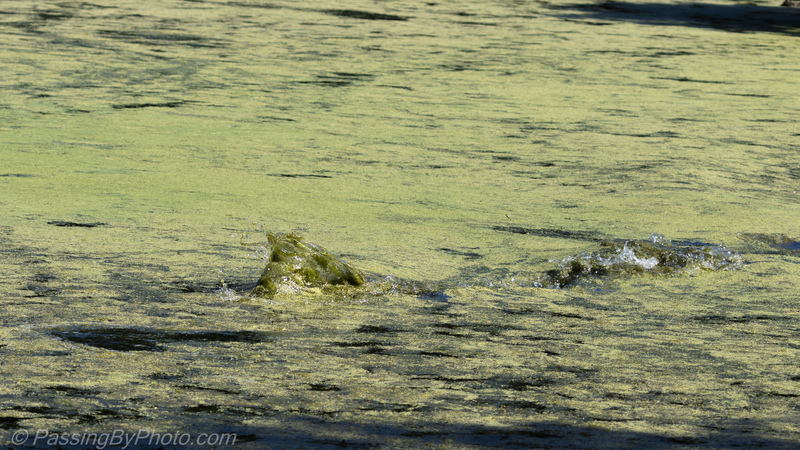 Then he plunged, stirring up the duckweed, looking a bit like a pea soup explosion. There is no doubt these creatures can move with speed when they want. After a lengthy time submerged he popped back up and floated in place. 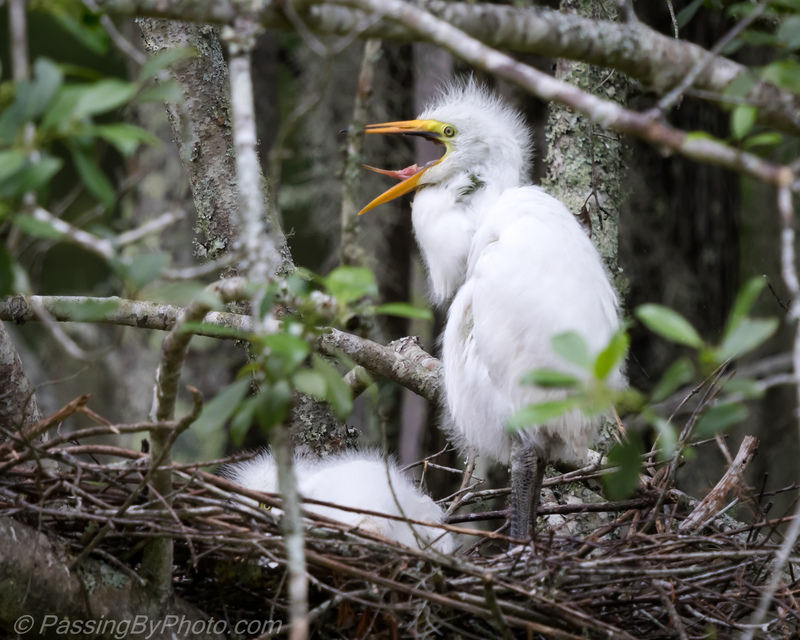 I did not see the Anhinga again, nor any chewing so I’m thinking the bird got away. Then a turtle swam by with just his head sticking up and the Alligator followed him to the trunk of this tree. The turtle disappeared around the back of the tree, seemingly unaware of his follower or perhaps incapable of doing anything about it. 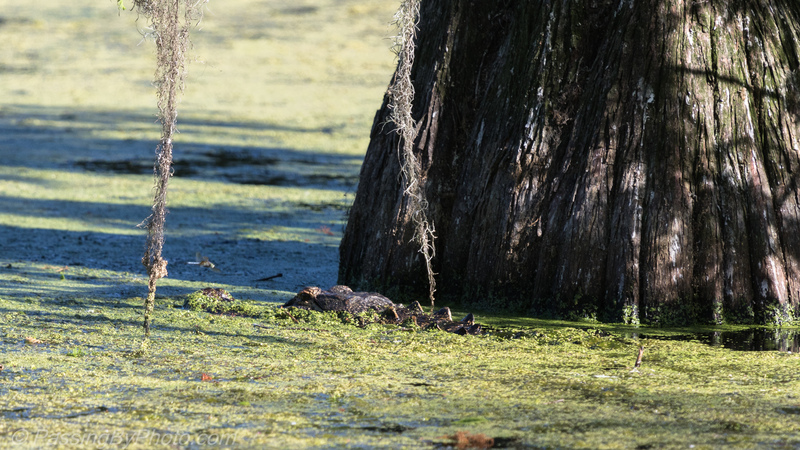 When I left the spot the Alligator had turned to have a view of the nearby tree with multiple Anhinga and Egret nests–just in case. We’ve had a run of dull days, no sun and lots of rain. There was a gap in the storms this morning and we took the opportunity to get out even though conditions weren’t optimal. 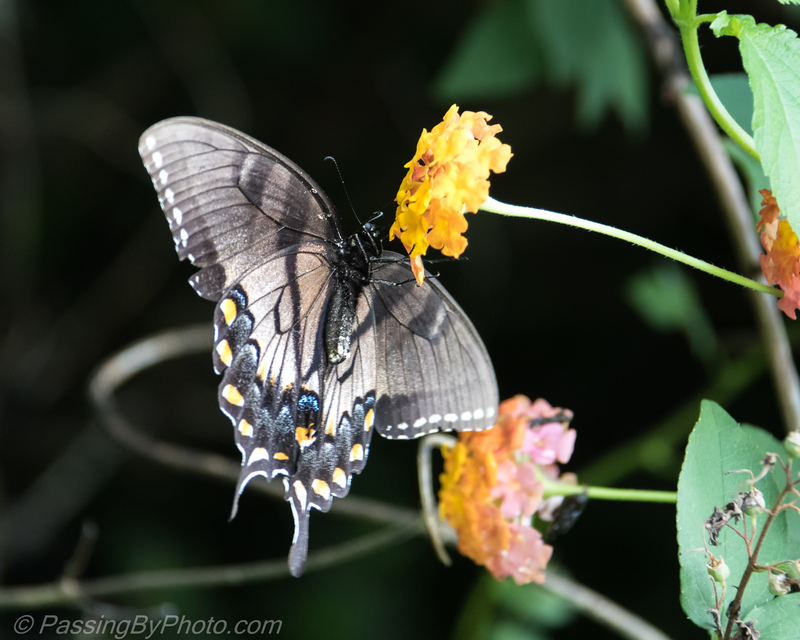 This Swallowtail Butterfly posed for some low light shots. 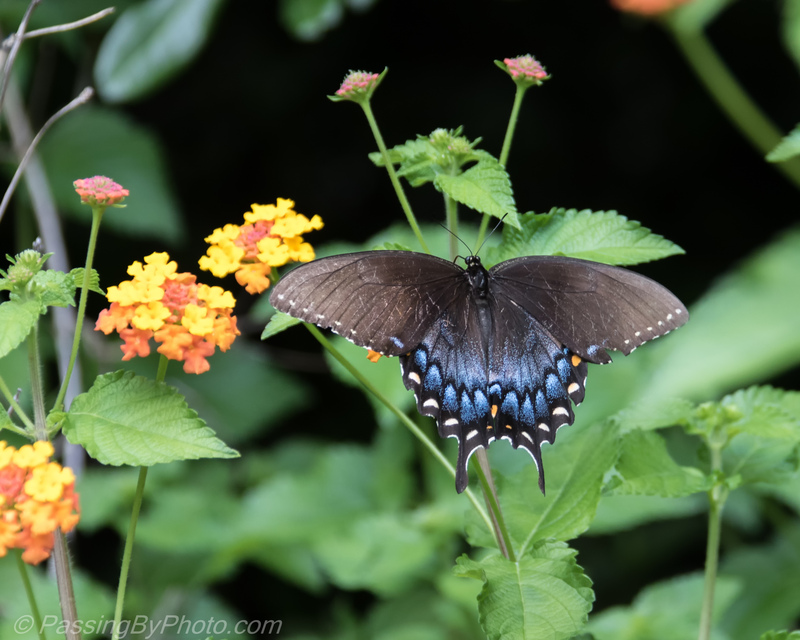 He very nicely turned around the flower exposing his underside to the camera. 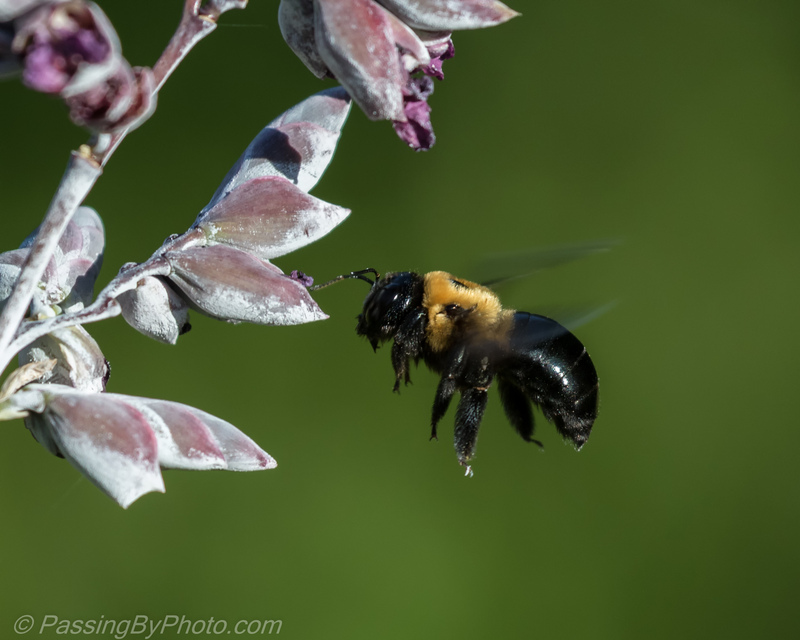 And kept on turning for a nice side view of his proboscis at work. The rain started again shortly after bringing an end to this meal. 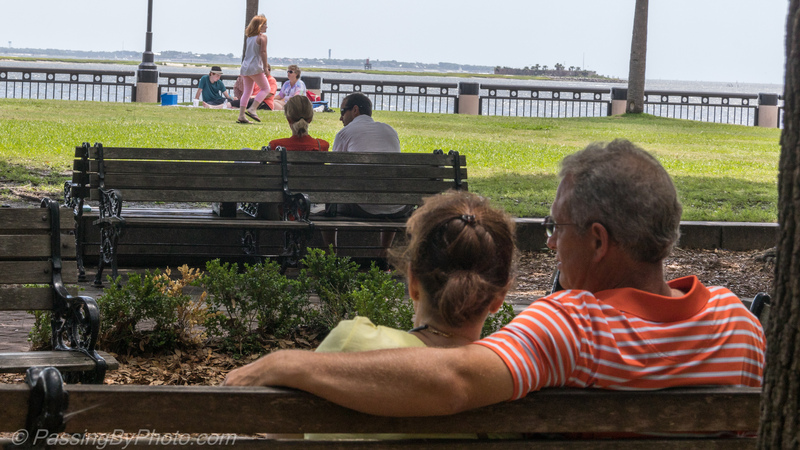 Couples, families and singles dotted Waterfront Park away from the more popular fountains, providing an endless supple of subjects for people watching and some candid photos. 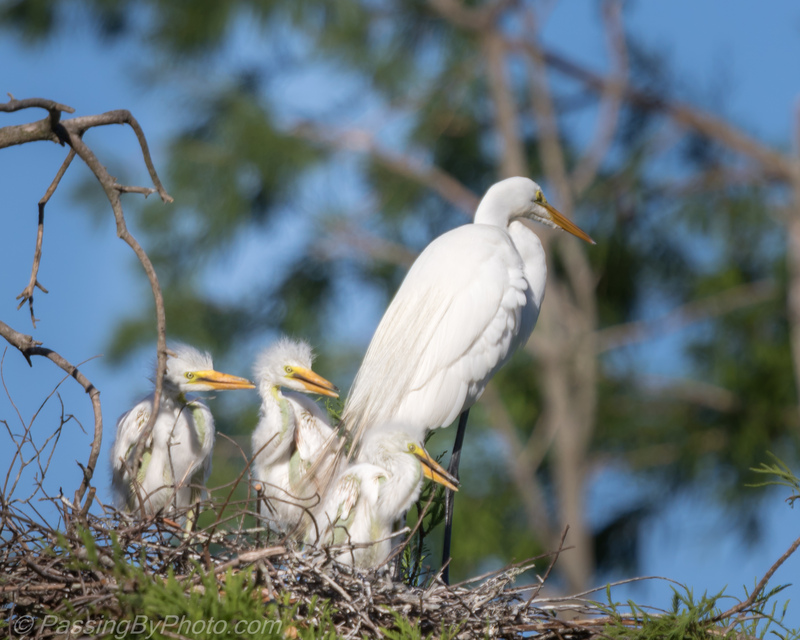 The Great Egret chicks in the top of the three nests in this tree are becoming more mobile and easier to photograph as they stand up to check mom/dad for food. 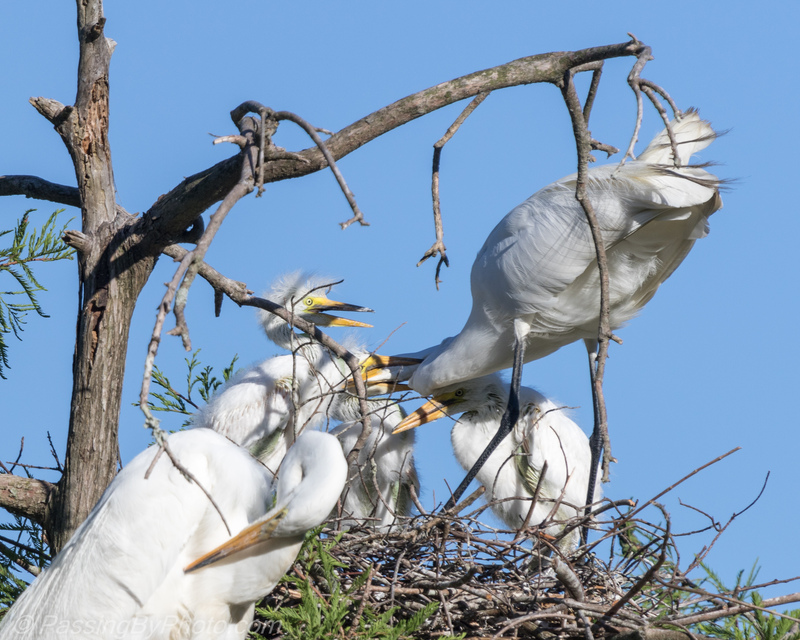 The other adult in the lower left is standing on her own nest on the next level down, where so far i have not seen chicks. The food is gone but the chicks’ beaks keep on moving. They maneuver to the edge of the nest, precariously close it appears from my vantage point. 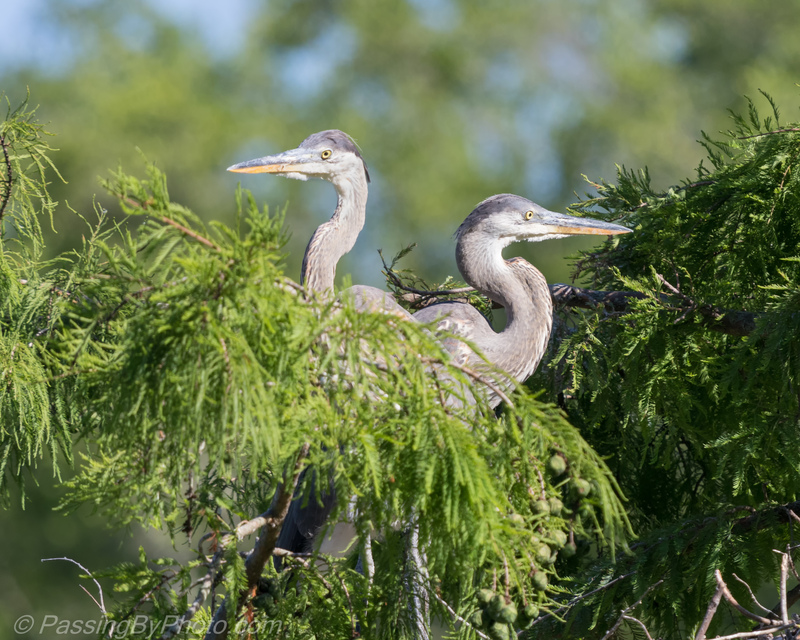 I likely made the same comment about the Great Blue Heron chicks. 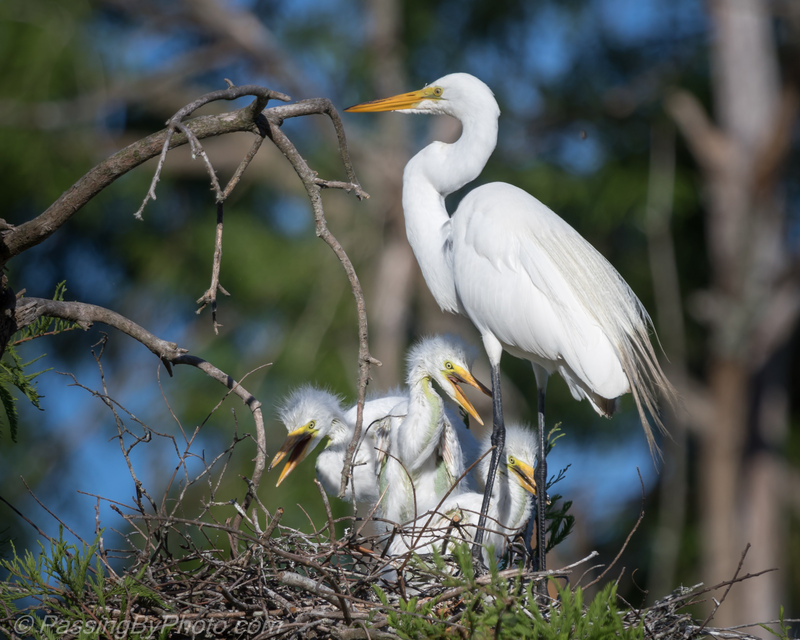 I’ve never seen an adult Great Egret or Great Blue Heron perform any type of protective move to get a chick away from the edge. The adult looks ready to fly off and get a break from the little ones. 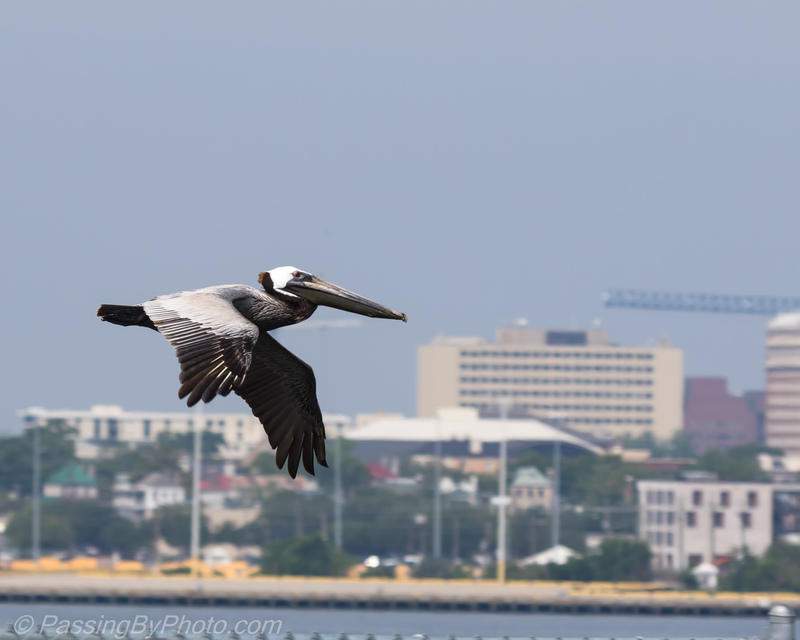 Quietly and without any fuss Pelicans glide around the edges of the harbor. Generally moving at a slow speed, the shot is all about the angle. 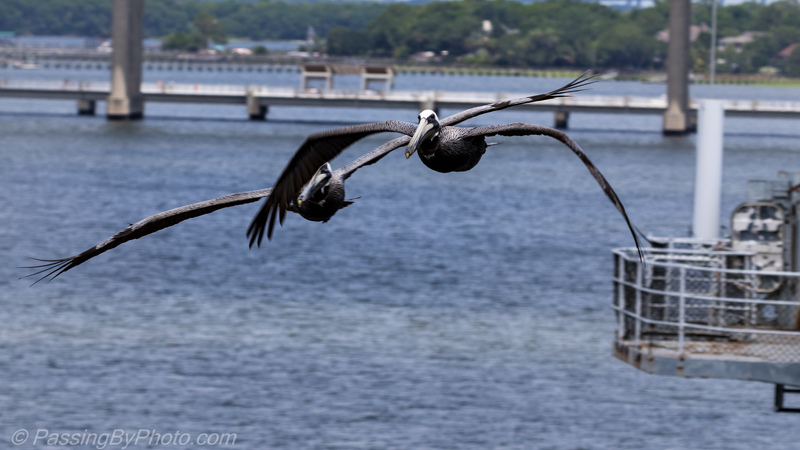 Coming straight at me, this pair turned together like a pair of dancers. They veered off at the last moment, following the shape of the USS Yorktown and staying over the water. I was at the edge of the flight deck where the deck becomes wider. 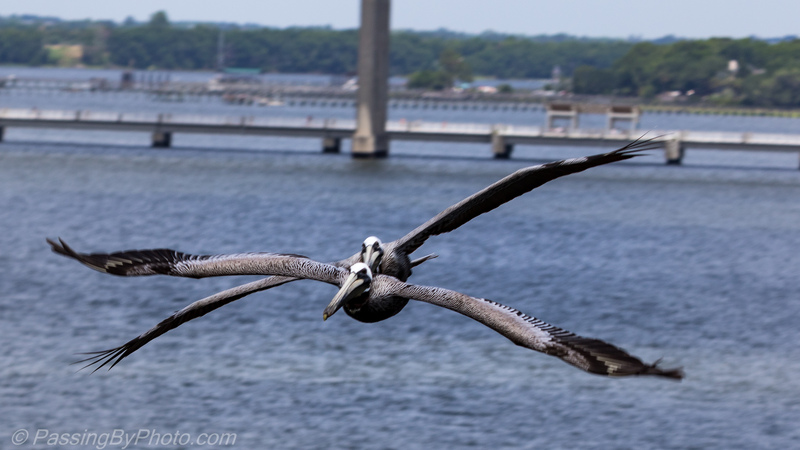 This single Pelican was also following the edge of the Yorktown, a little higher off the water, with the Charleston Peninsula as his backdrop. 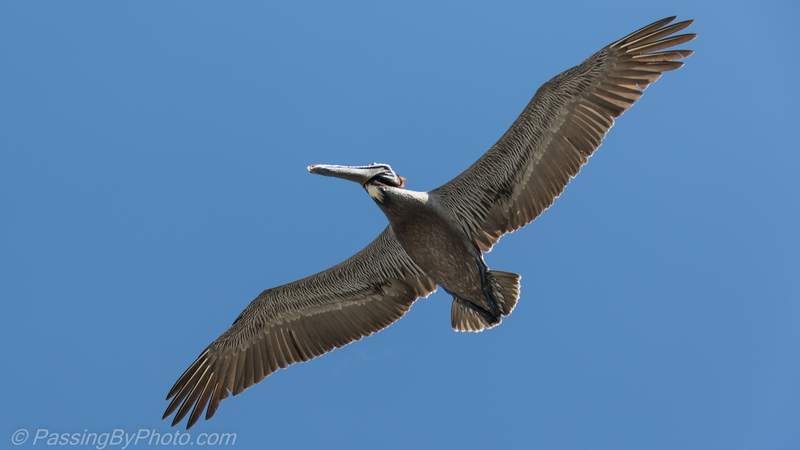 The Pelican’s large wingspan makes a shot against the sky work. The feather and chest detail show off nicely as he passed over me with just a tilt to alter his direction. Taken three days in May, 2017. 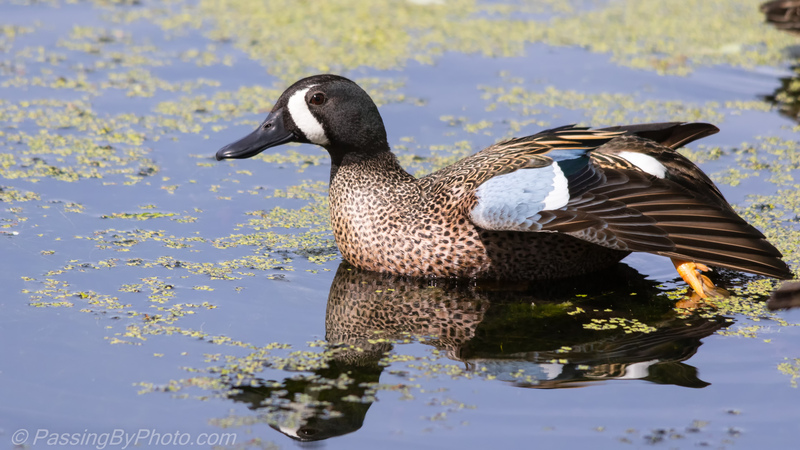 Does a Duck See His Reflection?